We compare three Hunt 36s with three different drive systems. Which is best? 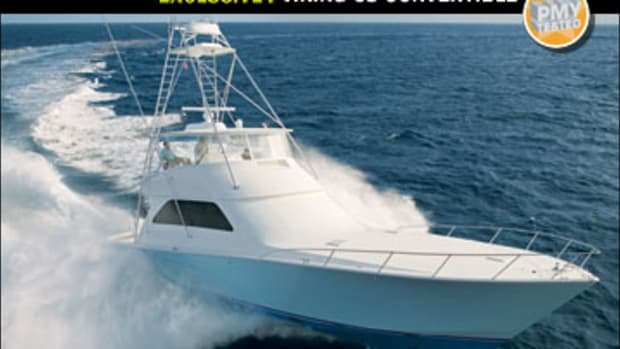 There are two kinds of powerboaters—those obsessed with engineering nuances like efficiency, reliability, and seaworthiness, and those concerned primarily with the fridge keeping the beer chilled and the satellite TV bringing in a crystal-clear picture on game day. Both love boats in equal measure, just for different reasons. 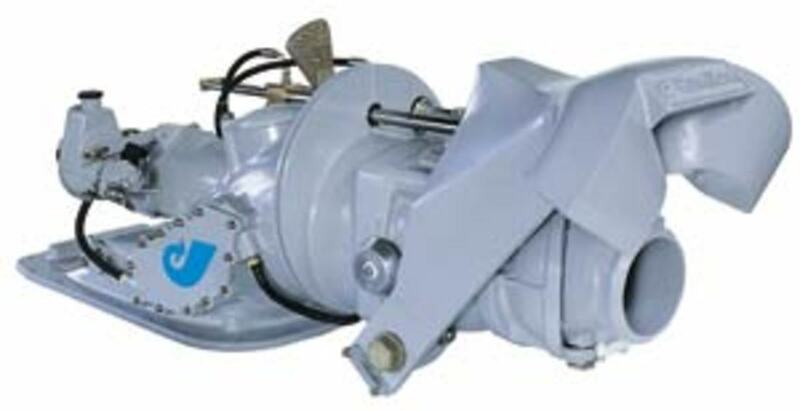 This story is aimed at the first group, though I suspect not a few of the second will find it interesting because the subject is one of the most fundamental questions facing anyone choosing a new boat: What’s the best drive system? In boats 32 feet and up, there are three main choices: straight inboards, waterjets, and pods. 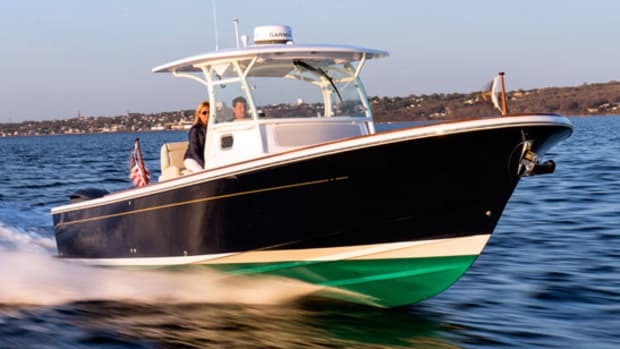 (Two other options—outboards and stern drives—are typically restricted to applications like center consoles and high-performance boats.) None of these is perfect; each has advantages and disadvantages that are inherent in its design and are fairly obvious to the experienced boater. But one thing’s not obvious: Which one is most efficient? The only way to definitively answer that would be to test three identical boats, each with one of the aforementioned drive systems, on the same day, under the same conditions. 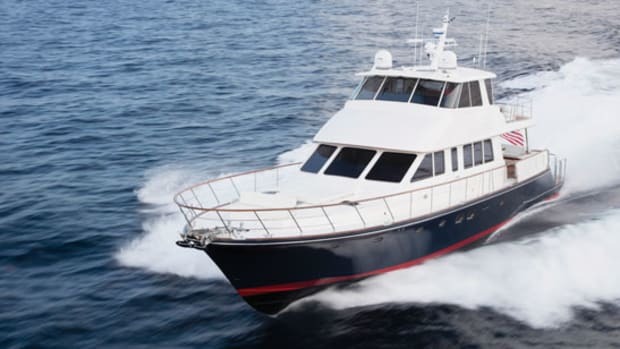 No one’s ever had the chance to do that until this past June 13th, when Hunt Yachts made available to us three Harrier 36s, one powered by straight inboards, one by Hamilton waterjets, and one by Volvo IPSs. Now admittedly these boats were not purely identical. 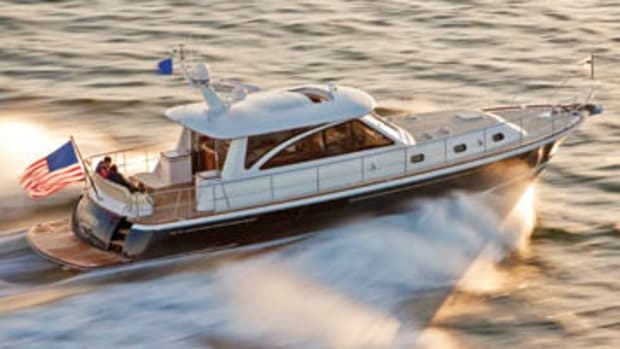 The inboard and jet-drive versions were powered by 435-hp Volvo Penta D6 diesels; the third boat had IPS 400s, which come with 300-hp Volvo D4s. Not ideal but theoretically, the IPS’s power deficit would show up as lower speeds but higher fuel efficiency. Then there’s weight. Because all three were owners’ boats, they’d been ordered with different equipment. 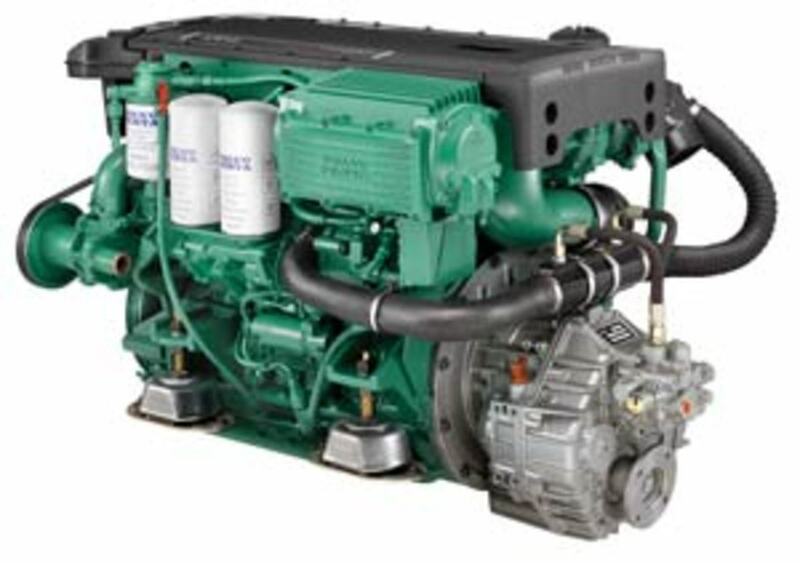 The IPS boat had a custom hardtop, 6-kW genset, and 16,000 Btu A/C; the inboard boat was relatively basic—no genset or A/C. The jet was somewhere in between. Fortunately, Hunt was able to supply an official weight for each version of the boat. After subtracting for fluids, here’s what I got: the straight inboard: 13,432 pounds and the jet: 13,944 pounds. Probably because of that hardtop the IPS boat came in heaviest at 15,356 pounds. Do the weight variations skew the results? For the jet and inboard boats, the answer is no. 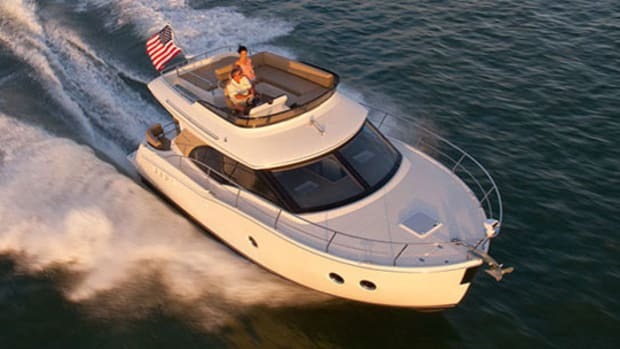 The IPS boat suffers from an additional 1,924 pounds (by comparison with the inboard), or around 14 percent more. But remember, these weights are without fluids. You’ll see the loads we ran with on test day noted below. And on top of this there were minor discrepancies in the amount of personal gear each boat carried. Still, even with these variances, our trio is as close to identical as we’re ever likely to see. And they were tested at the same temperature and humidity (both of which affect horsepower output), under the same sea conditions, and with three persons aboard. So how did our trio match up? In the interest of brevity, I’ve synopsized the data. You can see the test results in "The Test" tab of this article. You can read this data a lot of different ways. I chose to consider weight differences basically a wash, and doing so, what jumps out at me is how well the straight inboard boat did—just 0.7 knots slower than the jet boat and .15 nmpg more fuel-efficient than the economical (but heavier) IPS boat at cruising speed. But of course, there’s more to it than data. Each drive system has its advantages. The inboard’s main one is simplicity; the jet drive’s is shallow-water operation and top speed, and the IPS’s is maneuverability via an intuitive joystick system. And there’s driving impression, an admittedly personal criterion. I found the jet boat the most fun to drive. 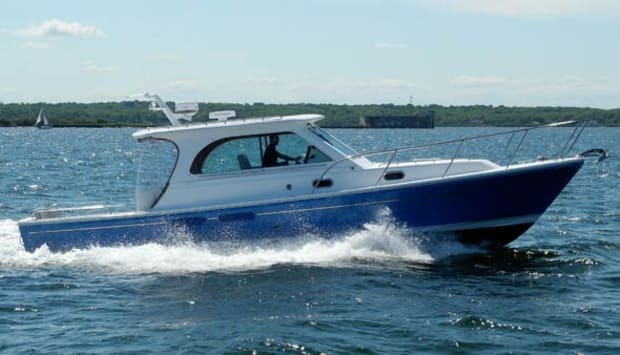 With just a turn and a half lock-to-lock and a turning radius of around two boat lengths, it felt more like a personal watercraft than a 36-footer. Its optional UltraJet joystick control made it highly agile dockside but it was far less intuitive than the IPS’s. The IPS boat was eminently maneuverable at any speed, but especially at slower ones. However, it exhibited a rather drastic heel in high-speed turns that I hadn’t seen before. I suspect it resulted from the combination of the Harrier’s deep-V hull form (21 degrees at the transom) and the IPS pods’ outboard-angled alignment, which probably had a multiplier affect. Nothing unsafe mind you, but definitely attention grabbing until you get used to it. And the straight inboard? 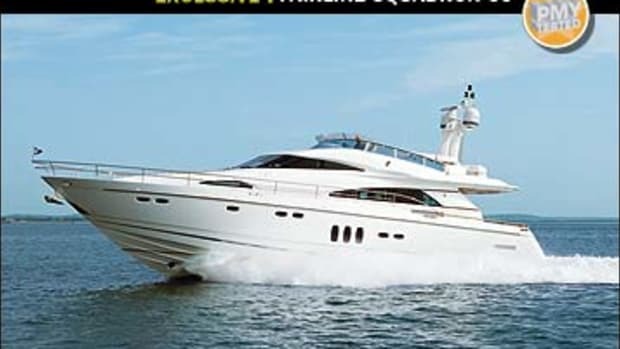 I felt comfortable on this boat even though I couldn’t corkscrew it or move it in any direction at the flick of a wrist. It was staid in comparison to the other two boats and yet a thorough pleasure to run. 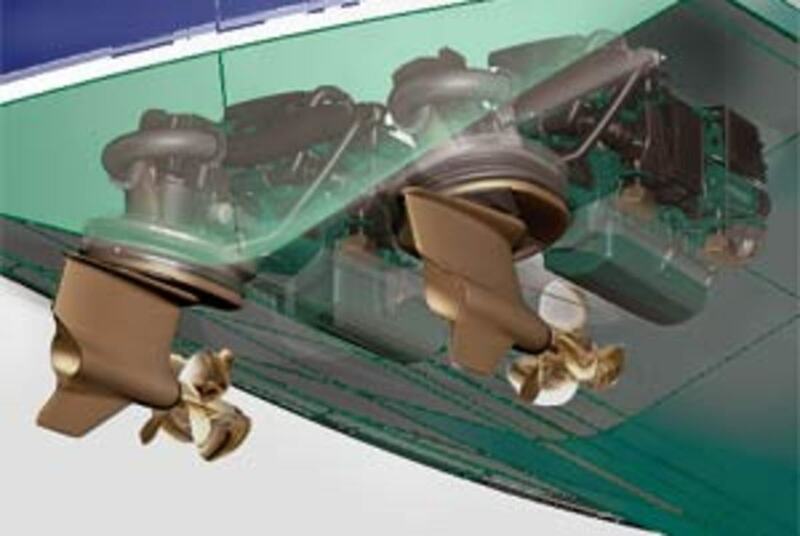 With the optional stern thruster (a bow thruster is standard) it would be nearly as maneuverable as the other two. Before you draw conclusions, consider ... money. 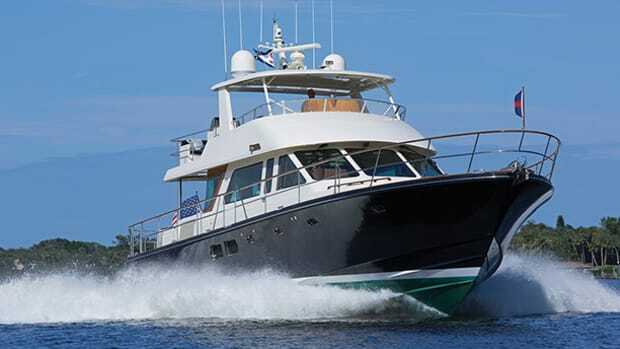 Standard power for the 36 (base price: $556,300) is twin 380-hp Yanmar diesels. 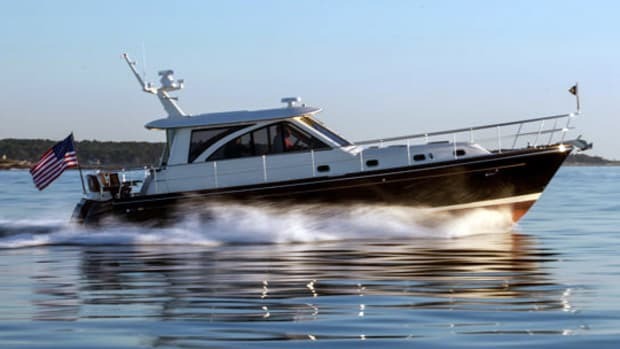 The more powerful Volvo D6s in our straight-inboard test boat cost an additional $18,920. 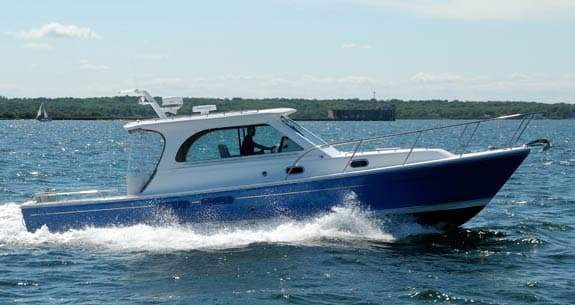 The IPS400 option is just $4,730 more, or $26,645 over the base boat—a bargain I’d venture. And that cool waterjet/D6 combo? The option will set you back $92,845, plus another $23,650 for the joystick control. So which Harrier 36 would you buy? Before you answer, consider that the ever-accommodating folks at Hunt also offer it with a single diesel ranging from 380 to 480 hp. 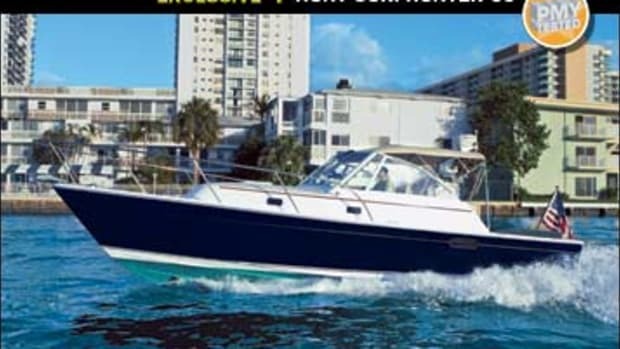 They say the boat hits 35 knots with the big engine, and it has a base price $88,300 less than the twin base boat. By my back-of-the-envelope calculation—using the time-honored diesel formula: (hp x .4)/7.2 = fuel burn at WOT, it should get 1.311 nmpg at full throttle, and much better as you back off. Confused? Me too. Sometimes the more options you’re given, the more questions you have. Unfortunately in boating, as in life, there are rarely any easy answers, and anyway, isn’t having more choices a good thing? Analyzing The Data Reveals The Pros and Cons of Each Package. Total Boat Weight(official weight plus Total Fluid Load): 14,688 lb. Simplicity is the key to the conventional setup, particularly on the underwater side. Props, struts, shafts, rudders ... that’s basically it. Total Boat Weight(official weight plus Total Fluid Load): 15,921 lb. Fun is the essence of jets. They run in shallower water than most other systems and often produce sports-car-type handling. Total Boat Weight (official weight plus Total Fluid Load): 16,671 lb. Maneuverability is the IPS forte. Add a trusty joystick and there’s almost no maneuvering situation you can’t easily handle.